Ukrainian President Petro Poroshenko has dismissed Heorhiy Tuka from the office of the head of Luhansk Regional State Administration and appointed MP Yuriy Harbuz of the Petro Poroshenko Bloc to this post. 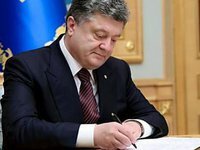 The president signed relevant decrees Nos. 194/2016 and 195/2016 on Friday, according to the official president's website.